Single speed cross bikes have intrigued me for their pure and simplistic nature since first taking up the discipline a few years ago, with hopes of putting one together for both racing and running around town. It wasn't until SSCXWC got announced that I knew I couldn't wait any longer. Just as the metaphoric wheels began to turn I got a text from Matt and we met that same cold, rainy spring evening inside a weird Irish pub in downtown Nanaimo. Brodie had decided to put out a limited edition frame for the prestigious partying ev.... I mean racing event and after being very apparent about the love for my Ti Romax they wanted to know if I'd have interest in a single speed version of the bike. With sausage casing stuck between my molars and mashed potato in my beard I gave a very enthusiastic, "YES!". Receiving this information so early in the year also gave me the opportunity to finally build up a truly brand new and custom bicycle. My Ti version was close but there were a few parts that were brought over from past bikes to get it complete in time for race season. Utilizing 7046 Kinesium Aluminum instead of Titanium has already proven to make for an incredibly stiff ride, but in all the ways you'd like a bike to be rigid. My usual "grind it out" style of cadence selection is complemented well by such a characteristic, as the bike feels very responsive to any watts thrown at the pedals. A useful feature after exiting out of the slower technical turns when it's time to pick up the pace for a straight. Zero flex. This iteration of Romax also happens to have internal cable routing which has already become a highlight in my eyes as it doesn't matter how awkwardly I grab it for a run up, I'm never worried about fubbing my cable tension. TRP was selected for the fork and braking system as they've recently released their carbon disc front end. Not only is the fork colour matched to the frame but it shares the tidy cabling theme of the Brodie as it internally routes the hydro hose through the rear of the left blade. If you decide to use the TRP levers my only suggestion would be to size down the length of your stem since the hoods are much longer than anything I've used in the past. An interesting design choice, but the added real estate seems to offer a more secure hand grip while really laying into the throttle. Confidence inspiring. Constantly wanting to show support for local builders, just as they show support for GRADIENT as a project, I reached out to a friend who had decided to take his passion for wheel building to the next level. Repechage Wheel Works is the name and as someone who wrenches for humans way faster than me including his better half, he knew what I was after more than I did. The result was a 45mm deep, 25mm wide disc specific carbon rim that would be set up for tubeless riding. Purple Thru Axle Hope Pro 2 Evo hubs were laced to the hoops in anticipation for an outlandishly bright build. These wheels will be getting their very own write up in the coming weeks so stay tuned. Everything else was chosen to set the new bike up as closely to my Ti Romax as possible leaving them indistinguishable while pitting mid race at both COTR and VCXC events. Completing the project includes parts from 3T, Thomson, Fizik, Shimano, and SRAM. 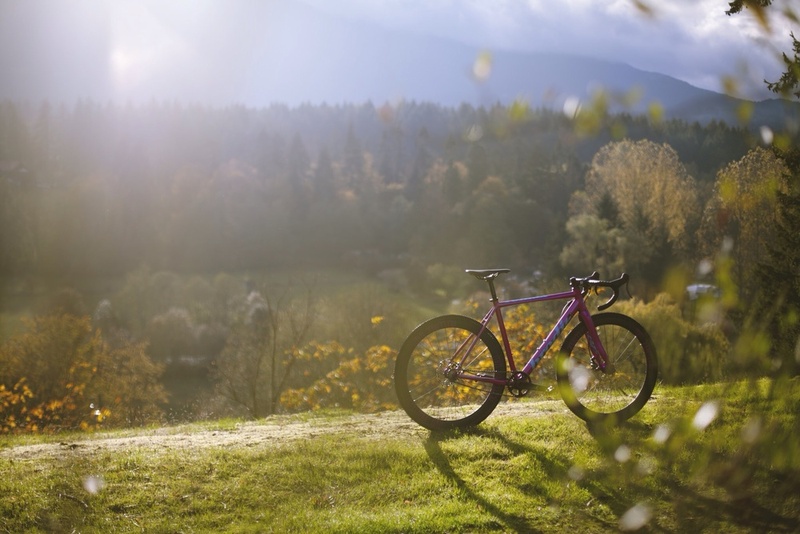 The final build definitely got a little out of hand as the outcome became so much more than a single speed grocery getter, and instead evolved into a full on race ready cyclocross bike, a World Championship caliber SHRED VESSEL!